I came to two realizations after watching the harrowing survival film “All is Lost.” One, this is the first time I’ve actually seen a Robert Redford movie in the theater and two, 2013 is one hell of year for great movies. 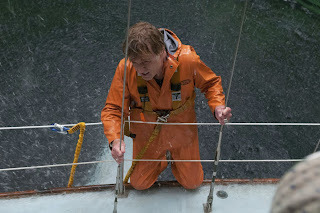 “All is Lost” is essentially a stripped down, more experimental version of the Tom Hanks drama “Cast Away.” Robert Redford stars as a sailing man, whose name we never learn, struggling to survive after his boat is severely damaged. He is the only character. And he hardly ever says anything. We learn nothing about him. We don’t know where he’s going or where he’s coming from or why he’s all alone. The movie instantly places us into his dire situation. And it’s all extremely fascinating. Those who found “Gravity’s” story lacking will be most likely be put off by “All is Lost.” It is, however, enthralling. “All is Lost” proves one thing: you can have a completely compelling film with only one character and hardly any dialogue. That is of course, if you have the right actor. Robert Redford has been a success most of his career mostly as a heartthrob to middle-aged women everywhere, but here at the ripe old age of 77 he gets a role he can really sink his teeth into. He plays an unnamed man who is on a boat all by himself. The film opens with some voiceover about how something horrible has occurred and that “all is lost.” We then flash back eight days where a giant metal cargo container has collided with his boat causing a large hole in the hull. It has caused lots of water damage but he’s able to dislodge it and repair the hole – which instantly proves that this is a guy who knows what he’s doing. The water has damaged his communication and navigation devices. Before he knows it a violent storm approaches which heavily damages his boat. He eventually abandons ship and takes to his lift raft where things go from bad to worse. Not much more should be said about what specifically occurs after that. There’s only two possible outcomes: he lives or dies. But that’s not important right now. What writer/director J.C. Chandor has concocted is a truly gripping survival thriller. There is minimal dialogue as one would expect from a film with one character. He doesn’t talk to himself though. He doesn’t need to “narrate” what he’s going for the audiences benefit. Redford is a fine, skilled actor and we get his thoughts and feelings just from looks and gestures. And even if there’s not much to his character it’s obvious this is a guy who knows how to sail and navigate. He’s resourceful. He uses plastic to collect condensation. He’s able to use some celestial equipment to plot out his location using the sun. His plan is to float into the shipping lanes where he’d have a better shot of being rescued. We know this without ever hearing a word. The film has a realistic quality that just makes the whole experience almost unbearably intense. You’d really thing they just threw Robert Redford out into the middle of the ocean to survive. You forget you’re watching a film. You forget that there are most likely film crew members behind the camera. It almost feels like we’re watching a screen legend try to survive and starve to death on the ocean. Camera work is fine and not flashy. Music is minimal and subtle. Sound is foreboding and almost otherworldly.